You won’t have regular allowance from your parents. You’ll have to really live your own life and earn your own. 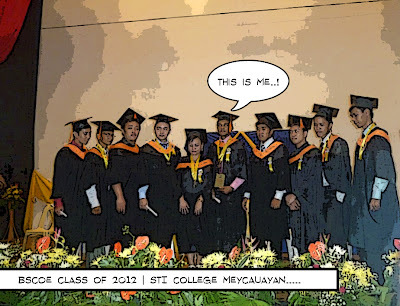 I graduated last May 10, 2012 at Valenzuela Auditorium. Our guest speaker was Rep. Teddy Casino. 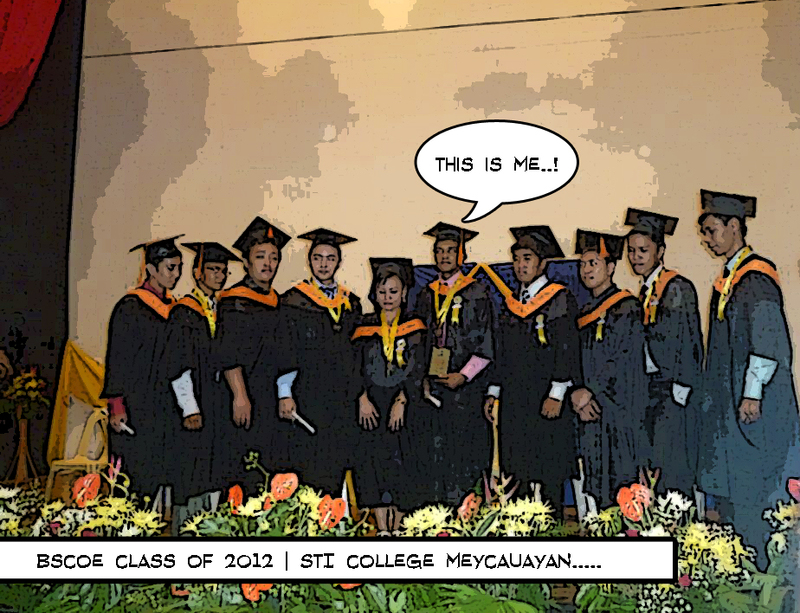 The ceremony started with baccalaureate mass that started at 3:00 pm and continued to commencement exercise. I am happy with the ceremony, everything just so smooth and solemn. I was surprised the day before the graduation](toga distribution and invitation giving day) because I was chosen as our batch’s Best in Hardware Interfacing. I am really into hardware and I love hardware so much. Though I think my happiness is not complete because my thesis mates didn’t even receive an award. I know their potentials and I’ve seen them working, they’re good. This pretty chapter of life has closed and I am happy of the outcomes and learning in college so as the years of studies in high school and grade school. Happy Family - With guardians, cousins and granny. When we talk about our Grandfather, we get emotional. This is also his dream, to see me graduate. Let me dedicate this to the Lord and to my Grandfather who continue to inspire me in the troubles of life. Now it’s June and the classes started. You know that feeling that you miss school but you are looking forward in building your own career outside the school yards. I need a freaking job by the way, before I am so thinking about the salary but now, I don’t think about it anymore because I know that it is hard to find and hit my dream job. It’s hard to be an Associate Software Engineer considering that there’s a lot of demands in the market, only few applicants are being hired. I’m a jobless fudge until now, any companies recommended? The examination part is what I am scared of. yes me too.. salary is not my top priority right now.. what I am aiming for is a stable job..
congratulations, galingan mo po sa susunod na hakbang mo sa buhay... may the good Lord bless you always, keep the faith. You are the best in hardware interfacing? I advise that you apply in a hardware store. :-P Just kidding. He he. Congratulations!!! Welcome to the world outside of college. Just be patient in job hunting. You will find the job that suits you fine. wow congratulation steve... nakakatuwa naman yung achievements mo... keep it up... I'm sure a lot of grtteat opportunities will come in your way... cheers! Belated greetings. Congratulations and all the best in your future undertakings. Congratulations I want say patient in key of success so keep patient and do fine. congratulations sa natanggap mong award. maganda tignan yan sa resume. goodluck sa jobhunt mo..